While plugging away at college entrance exam preparations, Zion Utsey momentarily jolts up from his laptop and drums on the dining room table, slapping the wood with expert rhythm. "See, that's the kind of thing you get in trouble for in school," his mother -- and teacher -- Monica Utsey says with a satisfied smile. "But I know when he's frustrated or thinking he'll stop and bang on the table for five minutes." 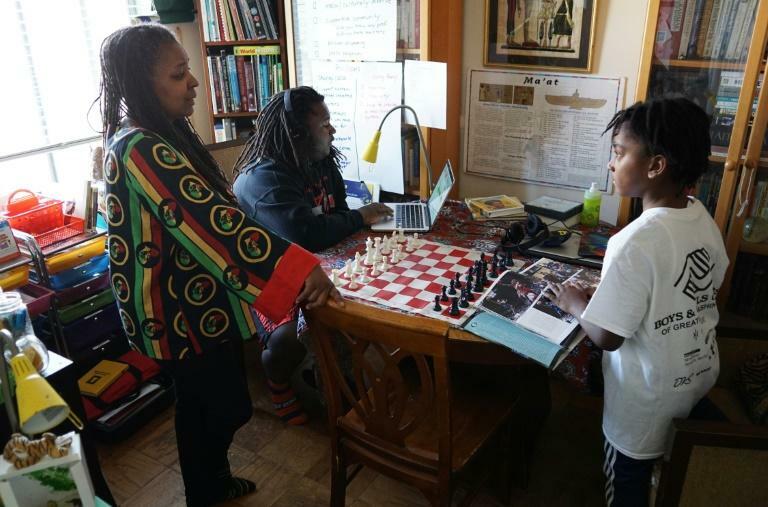 Though he is in his Washington home, Zion, 17, is in fact in school: he, along with his 10-year-old brother Ayinde, are two of the roughly 1.8 million homeschooled students in the United States. The Utseys also belong to a growing subgroup of African-American homeschoolers, families dissatisfied with traditional education opting to take matters into their own hands. 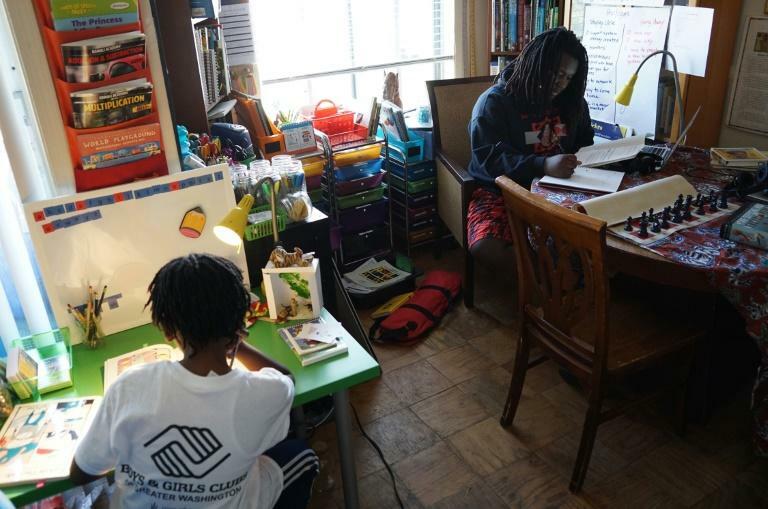 Few statistics exist regarding homeschooling, particularly when it comes to race, but the National Center for Education Statistics estimates some five percent of US homeschoolers are black. Research suggests that proportion is growing: Ama Mazama, a scholar of African American education at Temple University, said at least 200,000 black families homeschool today, more than double the 90,000 who educated their kids at home in 1999. Many parents keep their kids at home to give them a more free-wheeling, exploratory education; others cite religious or moral grounds. But Utsey ultimately chose homeschooling because she feared her sons would grow up without an appreciation for their African heritage. Like many other black parents, she also pointed to racism. Disciplinary policies in American schools disproportionately affect students of color: black students account for some 40 percent of all students who have received multiple suspensions, according to the American Civil Liberties Union, though they represent just 16 percent of public school enrollment. "I never wanted them to have to walk through a metal detector when they go to school," Utsey said of her sons. "I wanted them to feel that excellence is who you are." "A lot of times schools do not cultivate that kind of culture." Mazama said most black families she speaks to cite "a growing dissatisfaction with the public school system and a disillusion with integration." "African Americans fought really hard to get into the public schools," she told AFP. "But now 50 years later we realize the promises have not been kept." "Black children are being made invisible, disenfranchised." When she first began homeschooling Zion, Utsey figured she would eventually send him to school. She grounded him in African civilization and history in preparation. "I thought to myself once he gets to school, he'll be bombarded with slavery, so our focus now is going to be before then," she said. "The way that history is taught in general, the focus is on the contributions of a smaller group of people." 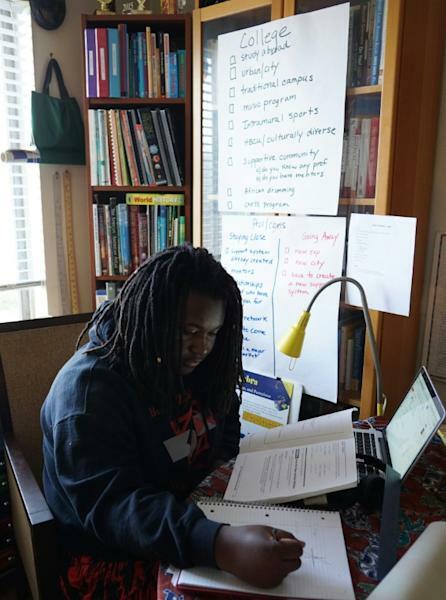 When Zion hit 10, Utsey committed to homeschooling her boys until they were college-aged. Now overflowing bookshelves line her walls, maps of Africa paper the apartment and her small dining room bursts with art supplies and math games. Both boys study African percussion and play sports; on this day the younger Ayinde was focusing on spelling, math and penmanship. Zion also takes courses at a science, technology and math-focused program for homeschoolers. Though Zion said he has wondered about the social aspects of traditional school, leaving his homeschool environment "would be stepping down." "Whatever field you want to go into, homeschooling is there for you," he said, noting that he plans to study engineering in college. In 2004 Utsey founded the Sankofa Homeschool Community to support homeschooling families of color in the Washington metropolitan area. The collective began as a virtual community and since 2012 has offered Afrocentric history and culture courses. A single mother since her husband's 2013 death, Utsey both steers her children's education and works part-time at a youth center. Money is tight and Utsey wishes government funding were available to homeschooling parents. Charities distribute some funds to homeschooling families in need, but the government does not offer specific financial help to homeschoolers. Nevertheless, educating her boys at home has been worth the challenges, Utsey said. She often reminisces on a moment from Zion's childhood, when he glanced up from his workbook to tell her, "Mom, I love being black. I just love the color of my skin." Utsey said the memory exemplifies the "blessing" homeschooling has been: "a lot of children -- especially African American children -- don't grow up feeling that way about themselves."